This is a very raw, honest and insightful book and I commend the writer and the publishers for continuing to print narratives that open up discussions regarding mental health. (Or maybe you have) how the constant barrage of information and misinformation affects our thinking and increases nervous tension. I will put up my hand and admit that I have been seriously influenced by the information/news of the world that has appeared and made itself so personal in my social media feeds. Perhaps it is timely that I address this review today, September 11, an anniversary that will affect most people on this planet. Perhaps this is the first “major event” that sent waves of nervous energy around the globe? We (Australia) woke to an atrocity that became very personal; live streaming, “on the ground reporting”, fear and anxiety, despair and grief stared us in the eyes and we responded to a tragedy that felt personal to us. And while we had a right to know about this shocking event, did we need to be so “involved” in someone else’s grief? 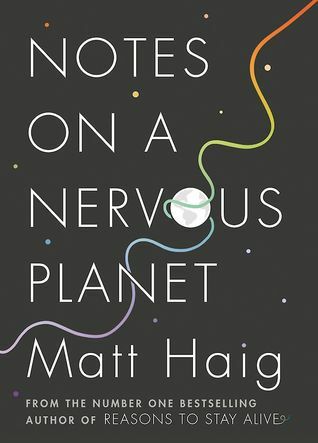 It is a complex situation but I can’t help but feel, like Matt Haig that we are creating/being exposed to /manipulated into being a very nervous planet; too much information or mis information is almost as bad as too little in these sorts of circumstances. Empathy is one thing…but we do not need to take on board someone else’s grief, fear, anger. You can listen, understand, sympathise with the problems around you but you do not need to “experience” the negative vibes yourself. A little distance can be good for the collective mental health of the globe. Do as Matt Haig suggests, take a moment, breathe deep, walk in the sun, walk in nature…switch off the phone, the laptop for a while…accept that technology and social media is a part of our life but not the only part. Engage with the real world more often, the benefits will be life changing. This entry was posted in Book supplied by publisher or author for review, Health, Memoir, Post Script: Book Reviews and tagged mental health, social media. Bookmark the permalink.